ENRIQUE SALDÍVAR-GUERRA is Senior Scientist and Head of the Polymerization Processes Department at the Center for Research on Applied Chemistry in Mexico. Formerly the president of the Mexican Polymer Society, he holds five patents and serves as a reviewer for the Journal of Applied Polymer Science, Industrial & Engineering Chemistry Research, and Macromolecular Theory and Simulations, among others. EDUARDO VIVALDO-LIMA is Professor in the Department of Chemical Engineering of the Faculty of Chemistry at Universidad Nacional Autónoma de México, and External Academic Member of the Institute for Polymer Research of the University of Waterloo in Canada. 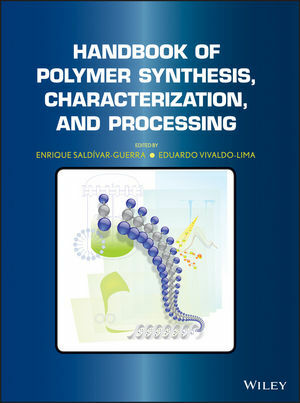 A former president of the Mexican Polymer Society, Dr. Vivaldo-Lima is a reviewer for quite a number of journals, including Polymer Engineering & Science, Journal of Applied Polymer Science, Macromolecular Theory and Simulations, and Macromolecular Reaction Engineering.